The South American country of Ecuador is home to approximately 15.5 million people. This past April, local Gideons and their wives, along with a team of international members, distributed over 200,000 copies of God’s Word to the people of Ecuador; to schools, colleges, medical centers and prisons. By the end of the week, at least 100 people made professions of faith in Christ. 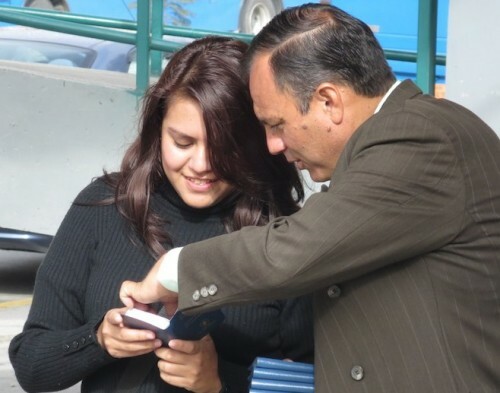 Gideons started in the city of Ambato to pray for the Lord’s guidance. Ambato is a city located in the central Andean valley. Several teams also distributed Scriptures at the local technical university. A team of Gideons handed out New Testaments as thousands of students passed through the campus. Over 80% of the Scriptures distributed during this blitz went to students for an ongoing investment in the next generation. While walking through a market, I gave an elderly Ecuadorian man a New Testament. I began showing him Scripture verses. He was kind and gentle, but held a sad, dejected expression on his face. He humbly asked, “Well, how can I be saved?” I explained salvation was a free gift and he only needed to believe, repent of his sins, and ask Jesus Christ to come into his life. His sad face transformed into a wide smile as he decided to put his faith in Jesus Christ. As a team of Gideons made a distribution at Alfonso Castillo School, they presented New Testaments to three teachers in the staff room. One of the Gideons asked if they were Christians. Two of them said they were. However, one of the teachers, Alexandra, said she was not. One of the Gideons asked if he could explain to her how she could become a Christian. She said yes. He asked her to open her New Testament to the back and explained the plan of salvation. When he was finished, he asked her if she understood she was a sinner and needed Jesus in her heart. She again said yes and prayed to receive Jesus Christ as her Savior. The other two teachers were shedding tears of joy as they watched their friend sign the back of her Scripture. They also agreed to provide spiritual guidance and support for their new sister in Christ. We rejoice in God’s promise that if we are faithful in sowing the seed, He will provide the increase. Thank you for being a part of this effort. Pray the Spirit of God will use these 204,000 copies of His Word to the eternal salvation of men, women, and young people in Ecuador. Praise God for receptive hearts. Toda la Gloria y Honra a Nuestro SEÑOR por el Blizt en Ecuador, Dios dara el crecimiento a esta semilla sembrada por los Gedeones y Auxilires, estaremos orando por este proposito. Bendiciones en Cristo. We’re getting closer HOME – (Matthew 24:14) what a wonderful blessing. What a blessing to see the work continue and in Ambato as well! Praise the Lord!! The time in Ambato was beyond anything we could have expected!! God is so good and so loving and so very merciful!! Praise His Holy Name!! Praise the Lord for His Word and Love. Thank all Gideon’s for their faithfulness! Por favor sigamos orando para que los frutos de este BLITZ sigan multiplicandose.